In this video, you'll add a timer that will keep score for your game. The longer the player's sprite avoids the chaser sprite, the higher the timer score. To start, select the chaser sprite and drag out the timer block from the sensing menu. In Scratch, timer is a variable. A variable is a storage container that holds a value for later use. The timer variable stores the time the game has been played. Click the check box next to the timer variable to display the value of the timer on the stage. When your player clicks the flag, the timer resets and starts running from zero. Program the chaser sprite to say the score when it catches the player sprite. Click looks and drag out a save for two seconds block and place the timer variable inside it. To test, click the flag, then the save for two seconds block. The chaser sprite says the number stored in the timer, which is how long the game has been played. Next, program the chaser to say the time if touching the player. Select the control menu and drag an if statement into the forever loop. Place the say block into this if statement. Finally, complete the conditional statement. If the chaser touches the player, then it should say the value of the timer. Click the sensing menu and drag out a touching block. Change the value to the name of your player sprite. Test your code and play your game. You can also invite your neighbor to take a turn and see if they can get a faster time. If you want to make your game more challenging, add more chaser sprites by right-clicking the chaser sprite and selecting duplicate. 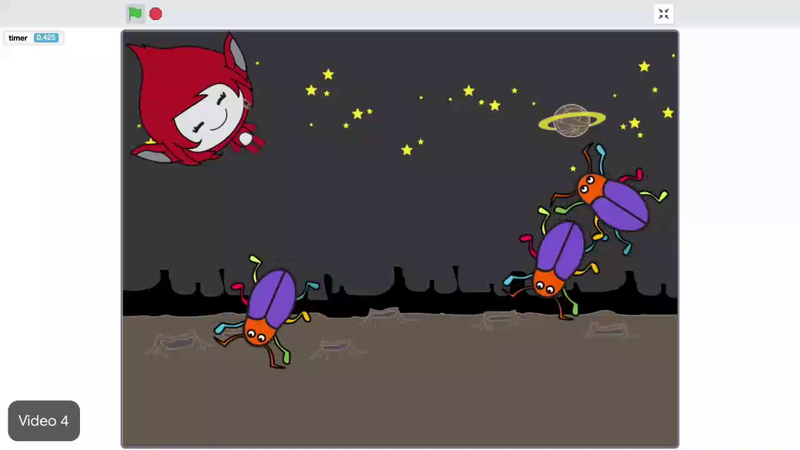 Scratch is more fun when you check out other projects and share yours. Share what you made with the Scratch community before you leave today. Don't forget to write a description and continue to explore different ways to customize your game and make it more challenging in the add-ons. Tell the player their time using if, touching, say, and timer blocks. Then, duplicate the chaser sprite to make more obstacles for the player to avoid. 2. The Chase Is On! Make the chaser sprite "say" the amount of time the player sprite survived. Make the chaser sprite "say" the amount of time the player sprite survived If the chaser sprite is touching the player sprite. Duplicate the chaser sprite to make more obstacles for the player to avoid.